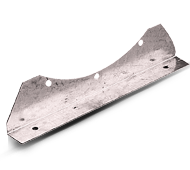 All feet are hot dip galvanised steel and designed to support the fan and/or attenuator. Should the installation require the fans to be installed in a vertical plane, please advise Fantech prior to order to ensure feet of the correct design are supplied. Bolt-on feet are generally supplied loose in pairs.